Lupeikiene, A., Vasilecas, O., Dzemyda, G.
The importance of databases and information systems to the functioning of 21st century life is indisputable. 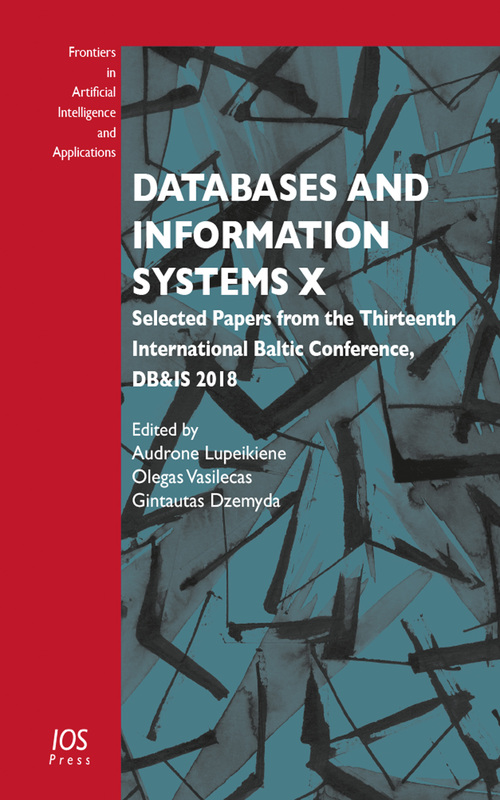 This book presents papers from the 13th International Baltic Conference on Databases and Information Systems, held in Trakai, Lithuania, from 1- 4 July 2018. Since the first of these events in 1994, the Baltic DB&IS has proved itself to be an excellent forum for researchers, practitioners and PhD students to deliver and share their research in the field of advanced information systems, databases and related areas. For the 2018 conference, 69 submissions were received from 15 countries. Each paper was assigned for review to at least three referees from different countries. Following review, 24 regular papers were accepted for presentation at the conference, and from these presented papers the 14 best-revised papers have been selected for publication in this volume, together with a preface and three invited papers written by leading experts. The selected revised and extended papers present original research results in a number of subject areas: information systems, requirements and ontology engineering; advanced database systems; internet of things; big data analysis; cognitive computing; and applications and case studies. These results will contribute to the further development of this fast-growing field, and will be of interest to all those working with advanced information systems, databases and related areas.